I don’t know about you, but I’m a fan of natural or organic skin care, but oftentimes I’m not a fan of the price. I like to know what I’m putting on my skin, or at least be able to pronounce all the ingredients. 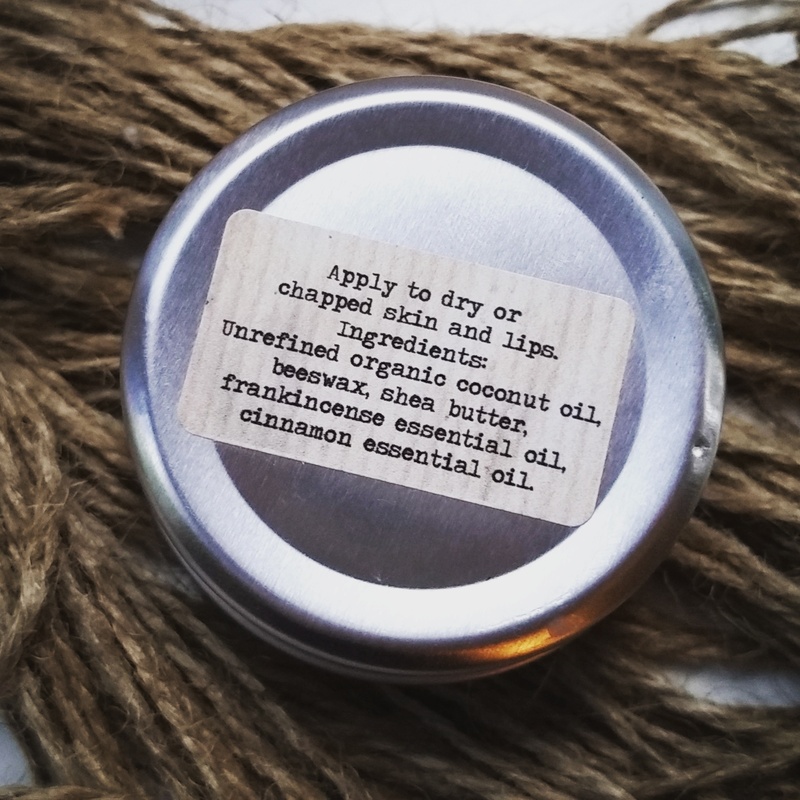 I love coconut oil and use it all the time be it in cooking, on my face, in my hair or even in place of Sudocreme on my daughter, so I was a tad excited to find a balm recipe that used it as one of a handful of ingredients. I made the balm for the first time in 2013, but found it a little too waxy, so after several test batches I’ve adapted it a bit and come up with this. This recipe will make a lot (48 50ml pots to be precise), so if you’re making this for yourself at home I suggest starting with 1 tablespoon of shea butter (or cocoa butter) and 1 scant tablespoon of beeswax and two tablespoons of coconut oil, plus frankincense and cinnamon oil to your liking. Put the shea/cocoa butter and beeswax in a large saucepan and melt gently stirring periodically until they’ve melted, then add the coconut oil. Once the coconut oil has incorporated add the essential oils and stir. Drop a couple of drops onto a ceramic plate (it’ll set quicker due to the plate being cool) and leave to set for a couple of mins. Test this out on the back of your hand. Are you happy with the consistency and aroma? If not just adjust according to your preferences (adding more beeswax will make it more waxy, whilst adding more coconut will lead to a softer consistency and lower melting point. Pour or ladle into containers of your choice. I bought some little metal jars with screw on lids from eBay. Be careful, hot oil burns! 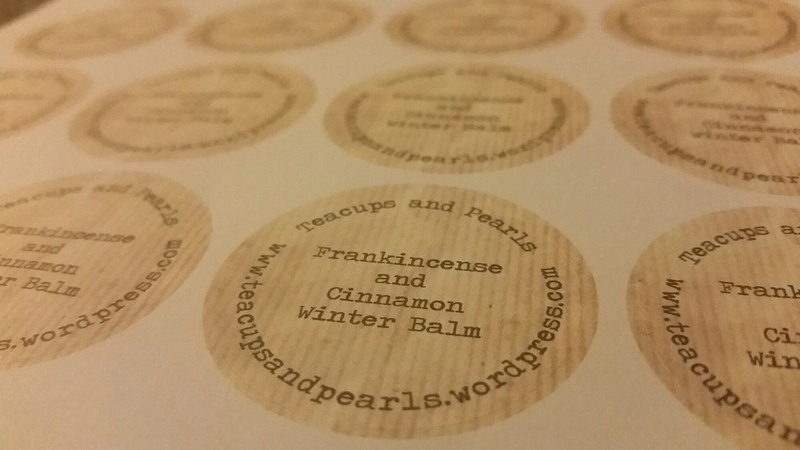 Print or order some labels to finish them off nicely, and you have a perfect little homemade Christmas gift. 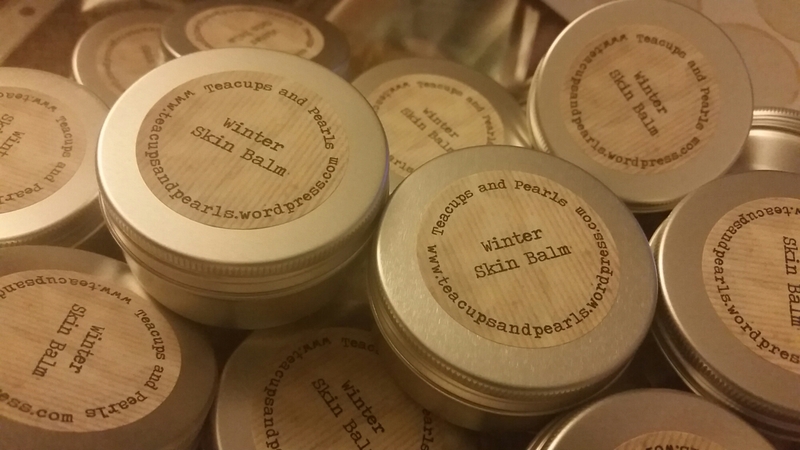 They’ll keep for months and months and you can use them as lip balms, dry skin balm or regular moisturiser, although because of the high oil content it can be a bit greasy for a day cream, but it is lovely all the same and has got to be better than the shop bought chemical infused options. If you live in the UK the balm is now available to buy here. If you liked this post, you might like my super easy head lice repellent, Naff off Nits. Plus, did you know we have a Facebook page? Check us out! Search for Teacups and Pearls and check the ‘like’ button. Wow, what a great idea! Can you post how much you used / how big the containers roughly are for a point of reference? Really great, thanks! Hi Erin, yes of course. I used about 500g each of Beeswax and cocoa, and about a kilo of coconut oil and then almost 10ml of frankincense oil and about ten drops or so of cinnamon oil. Of course, this isn’t an exact art. If you use a little less or more of one thing it doesn’t really matter, the consistency will just be slightly different (just hold back on the beeswax, my first batch was way too waxy). As for the containers I bought ten 50 ml pots, and had three 100 ml pots left over from last time. I filled those easily with that amount and ended up using a few jars I had lying around too. I’d maybe suggest using 250g each of cocoa and beeswax and 500g coconut for your first attempt unless you specifically want a lot of balm. Enjoy and let me know how you get on. What can I use instead of beeswax? You could just leave it out but the balm will melt faster when applied to the skin, or add extra shea/cocoa butter. Must it be frankincense? Not keen on smell ? No, not at all. There are a huge variety of essential oils you could use. I just like frankincense because it’s so great for your skin. Is it possible to make these into bars instead of a balm? Yeah absolutely Kathy. You don’t need to change anything bar (see what I did there?! :-D) the container you leave them to set in. I’ve done them before in individual loaf tins, or even muffin cases. Just flip them out once they’ve set and store in little bags or even one of those plastic soap bar boxes you can get for travelling. Personally I prefer them in tins as they’re less messy to apply, but each to their own. In fact Kathy, if you look on the photos, I ran out of containers and ended up using a muffin case supported in a ramekin. I let it set in three and then removed the case. It worked well. 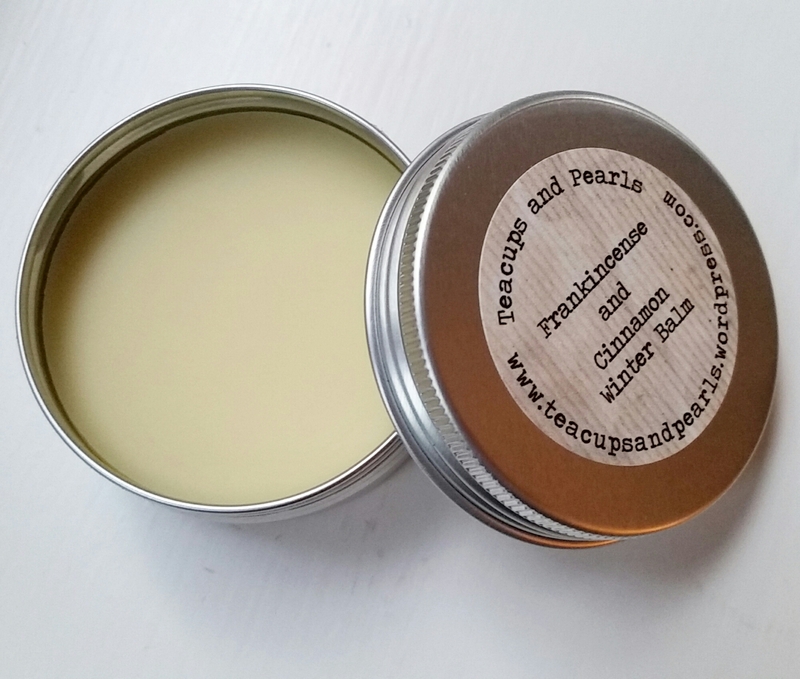 Hannah – where did you get your coconut oil and beeswax from? I got coconut oil at Holland and Barret but wondered if you knew of anywhere cheaper? can these be stored in the freezer until Christmas? Hi Ashley, absolutely no need to store it in the freezer. As an oil, it will last perfectly well so long as it’s kept out of sunlight. This recipe sounds wonderful! Could you tell me where you bought your ingredients ? What brand of essential did you use ? Thanks Teresa, I love it and everyone I’ve given it to raves about it too. I usually but all my ingredients from Mother Nature’s Goodies. They have a great eBay shop here : http://stores.ebay.co.uk/Mother-Natures-Goodies As you’ve probably noticed in the pictures, there is a jar of coconut oil as well. That’s because I ran out of my usual organic unrefined stuff I get from MNG, and had to make do with whatever my local supermarket had available. Let me know if you have a go at making it and how it turns out. Hannah. Could you please convet the measures to USA measures. I’m embarrased to say that I don’t know how to measure with your measures but I don’t..
I’m really sorry Jean, but I’m not sure what you work in out there. I generally use equal quantities of cocoa butter and beeswax, and then double the amount if coconut oil plus essential oils to get your desired aroma. Hope this helps. Jean, to start, do a cup of cocoa butter, a cup of beeswax and 2 cups of coconut oil. 1/2 cup beeswax, 1/2 cup cocoa butter, 1cup coconut oil, 10 drops cinnamon, and 20 drops of frankincense. Melt the first three ingredients till all are totally liquid, in a double boiler. Remove from heat. Allow to cool a little then add your scents. Pour into your containers. I always like to make smaller batches the first time to see how much I am going to like/use it. Then make more/change recipe as I like! I cannot wait to try this one as I love cinnamon and frankincense! Thanks for that Leialoha! It was a big batch, but they were Christmas pressies so all went. So long as you use the ratios stated, it should work out great. Enjoy! Look up DoTerra oils and their uses on Pinterest. There is lots of wonderful information on using oils. How many containers did your batch make and what size containers? Thanks! It made 48, 50ml tins but they weren’t full to the brim. Pinterest has charts for essential oils and their uses. What would you recommend instead if coconut oil as I am anaphylactic to coconut? Shea butter would work but it does have a pretty strong oder to it , which I personally don’t like . I use more essential oil to mass the shea butter. Haha. 👍 good luck . I plan to give this recipe a try myself. Thank you. Thanks for the comment, I actually tweaked the recipe last week and tried equal amounts of coconut and shea and half the amount if beeswax and it turned out great. The shea I used had a slight odour but the it wasn’t too strong and the essential oils masked it anyway. Olive oil, sweet almond oil, palm oil all work with beeswax. I use them to make creams. Wondering about adding a swirl of pomegranate for a festive color? can I use fractionated coconut oil for this? Fractionated coconut oil is liquid and won’t set up. Great recipe for the upcoming months! What is the consistency supposed to be like when they are done, and how do you measure out your beeswax? I made some on the weekend and it is soft like the consistency of coconut oil when it is at room temperature. I shredded 1/2 cup and a bit more beeswax and scraped out 1/2 cup of cocoa butter and mixed it with 1 cup of coconut oil. My beeswax is in a large brick and is very hard to cut. Do you have any tips for cutting this? P.S. Does anyone know of a coconut oil that does not smell like coconuts? I used to use this brand called Chapman’s Farm Naturally Pure Coconut oil and it did not smell like coconuts and it was discontinued. 😦 I need to find another like it with no smell. Please help if you can. Hi Angela, thanks for the comment. I’ve used it on my lips a few times and don’t find the smell/taste overpowering, however, if I was making it specifically for lips I’d probably reduce the essential oils and the beeswax and increase the amount of coconut oil to make the balm slightly softer. 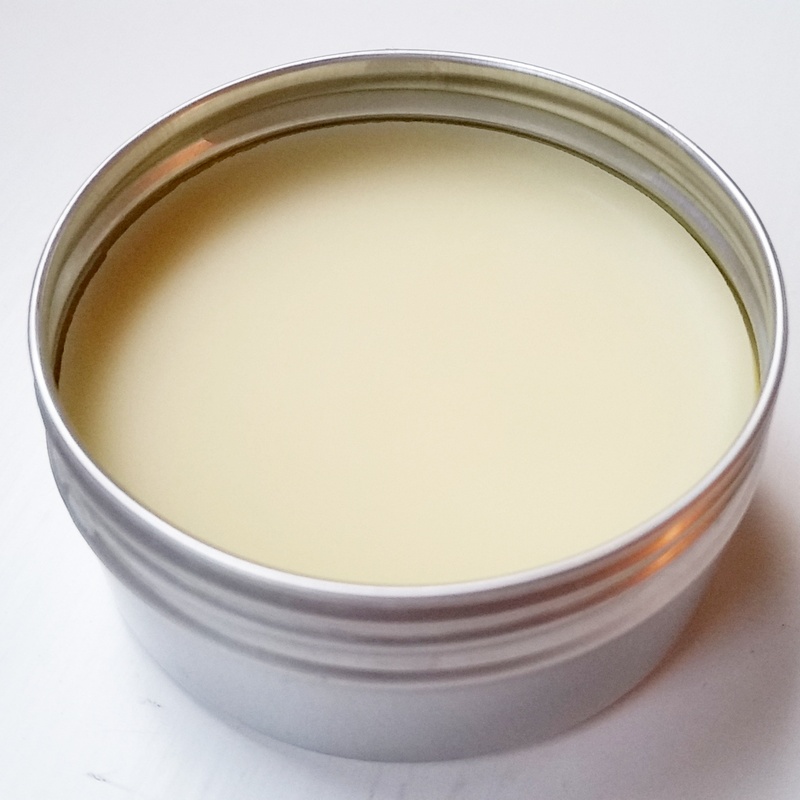 I haven’t actually made any more of the balm recently as I still have some left from my last batch, but you can add pretty much whichever essential oils you fancy, just be sure to check them out first as some can be very strong and cause skin reactions. Hope this helps, Hannah. Breezy Flower what about maybe an olive oil in solid form? Hi! Thank you so much for posting this! I love making all natural, from scratch products for my home, family and for gifts. Making salves and lotions are some of my favorite things to make, especially with Christmas coming soon! I have never tried this combination of essential oils, so I can’t wait to make this! I am so happy to have found your blog! I would like to reblog this on my blog if you don’t mind. Have a great week! I can’t wait to make this Frankincense and Cinnamon Winter Balm! Do you make homemade gifts? I love to make salves and lotions for my family. I will be making this as soon as my bottle of Frankincense essential oil arrives! Do you ever use shae butter for this recipe? What are your thoughts? Hi Sheila, I’m sure you could use shea butter instead of cocoa. I’ve never tried it, but am interested to find out how you get on if you try it. Do let me know. Hi Erica, it certainly can be used for chapped cheeks. It does feel a little greasy when first applied, but I find it absorbs really quickly, and the richness is great for super dry and chapped skin. Oh my goodness that is such a great idea totally using this for presents!!!!! Just came across this on pinterest. Can you tell me what you used to make labels? Is that a template that you print onto? Hi Porter, thanks for the comment. I actually cheated on the labels and bought them from eBay. I told the alert what I wanted on them and then they posted them out to me as I’m really not great when it comes to computers and printing! Ah! Just read the previous post sorry! I am making lots of balms for gifts this year and this one is pretty consistent with the recipes I’m finding so no complaints! I just made it, however, and I definitely recommend adding the cinnamon oil one drop at a time. I added ten drops and no matter how much frankincense I added, I can only smell the cinnamon 😦 It’s much too over-powering! Bummer, but I don’t know what I could do to fix it at this point (now solidified in tins). Ah, that’s a shame Anna. What quantities of the other ingredients did you use? In my batch the frankincense definitely out smells the cinnamon. It’s important to remember though that as with all natural oils each batch will differ in smell and potency slightly so yes, definitely add one drop at a time and to your own personal preference. I use almond oil and/or grape seed oil rather than coconut and I use Shea butter and green tea butter. It comes out very well. Hi Laura, yes, I’m sure that’d be fine. It’s there as a setting agent really, so doesn’t matter whether it’s raw or refined. The kind I use are yellow pellets. Hello, for the cinnamon and frankincense lip balm can I use mango butter instead of cocoa butter ? Hey Brenda, I’m not familiar with the consistency of mango butter, but if it sets relatively solid then I’m sure it would be fine. Well worth experimenting with though. Let me know how you get on. This is going to be fun to try! Frankincense is wonderful for your skin too! I think I may try the frankincense, orange, and clove together. Eucalyptus would also be great with a shot of lemon or lime. You could probably even make some cubes for those who have wax warmers. Hi Teresa, I actually order mine on eBay. I use 4cm round ones for the lids and tiny rectangular one on the undersides with a list of ingredients. Hi, I was just wondering about the essential oils. I read that it should be used 2-3% of essential oil into the whole mass to be effective. So I was just wondering isn’t it too little you put if you make such a huge amount of the balm? Hi Mon, thanks for the message. I tend to just go off the aroma to be honest. I don’t want it to be overpowering so I just add the oils until I’m happy with the fragrance. In this case it was the quantities listed above and it smells divine! Ah ok. Thought it was supposed to have some healing properties as the frankincense does the purpose 🙂 But good to know it’s more for the scent so I could add some more 🙂 thanks for the quick reply! I think most of the healing properties come from the organic coconut oil to be honest, but I use a good quality frankincense which I’m sure will carry some benefits in the quantities I use. I think you may find your quantities overbearing so I’d be cautious about adding in too much too soon.